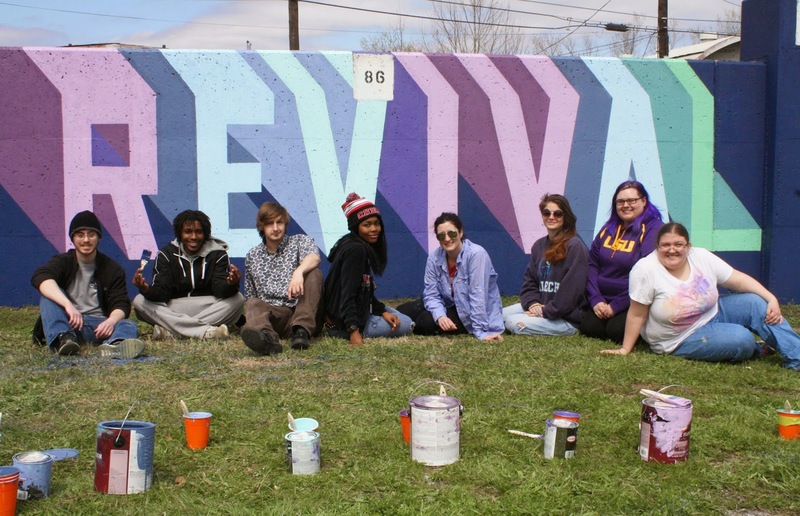 Students from Memphis College of Art completed a public art project this weekend to enhance an area of Midtown Memphis. The project was made possible by a grant from ArtsZone, a collaboration between AutoZone and ArtsMemphis, to support public art projects in underserved areas of the city. The Memphis College of Art was one of 17 organizations funded through this collaboration. At Memphis College of Art, the ArtsZone grant funded scholarships for five students from Shelby County. The scholarship offers students opportunities for professional development and equips them with skills and experiences for the future. Freshmen Ashley Wells, Madison Petri and Jacob Lambert, sophomore Sylvester Fair, and senior Glen Chase Hunter were named 2015 ArtsZone Scholars. Under the direction of MCA Assistant Professor Cat Normoyle and project assistants Bailey Brocato and Annie Kominek, the students painted a mural to beautify the Chelsea floodwall located at the corner of N. Evergreen and Chelsea Avenues, just north of Midtown Memphis. The mural is part of a larger, ongoing art project with other local artists that will evolve over the course of the next two years. The mural will add beauty and enhance the area for nearby residents and those who travel through the area by car and/or bicycle. Normoyle serves on the board of the Memphis City Beautiful Commission and is also consulting with the Greater Memphis Greenline as the lead artist for the mural project. MCA students had the privilege of being the catalysts for the mural project. Eventually the floodwall will be covered with 70 panels, each measuring six feet tall by 20 feet long.